The Downey Symphonic Society presents ¡Viva la Música! October 20th, 2018 at the Downey Theatre. With an American premiere by composer Oscar Navarro, who composed the official symphony of the city of Downey, the Downey Overture. Clarinetist David Van Maele will perform the Clarinet Concerto no. 3. Also performances of influential pieces by Latin composers such as Alberto Ginastero and Maurice Ravel. Music Director Sharon Lavery will give a pre-lecture talk at 7:15, and the Downey Arts Coalition presents a new group art exhibit “Viva el Arte.” In the lobby beginning at 6:30. 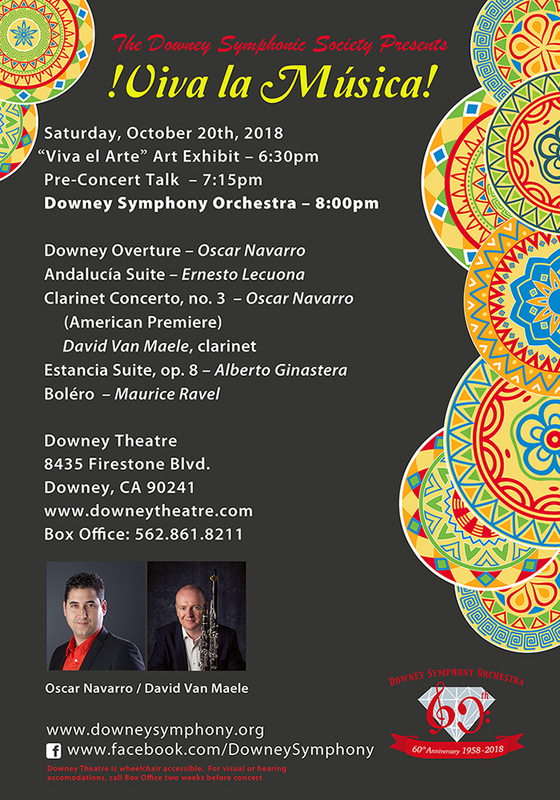 Celebrate the 60th anniversary season of the Downey Symphony Orchestra, bringing top quality professional symphonic music to Downey since 1958.